In the mid-18th century, Mont Redon was bought by a member of the nobility: Joseph Ignace d'Astier, a lawyer and a Doctor in Law from Avignon. Mont Redon then passed into the hands of the Mathieu family. Anselme Mathieu, known as the Marquis de Mont Redon, ran this estate with his brothers when their father died. But then disaster hit the family and the estate had to be divided up. 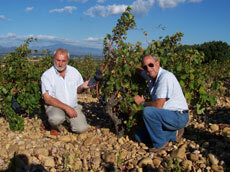 In 1923, Mont Redon was bought by the Plantin family. Henri Plantin decided to regroup the various parts of land and give the estate its current physiognomy: that of a property covering a total of 162 hectares, including 100 planted with vines. Château Mont Redon, a family estate for four generations, with its ever-present vineyard, has a long list of references and a great tradition.